OK, maybe not exactly...but kinda?? The actual theme is to use punches and dies on your project. As always, the crew would love for you to play along with us! While you are there please share some loves with the rest of the crew! Fabulous job, look at you getting into the collage type cards, awesome. ... stick of cinnamon made all the difference😂 This is such a cool card, I love the springy colors atop the newsprint! Just looks right, you know?! Donna, love the soft contrast of your Spring colors punch and die cut papers with the news print background. 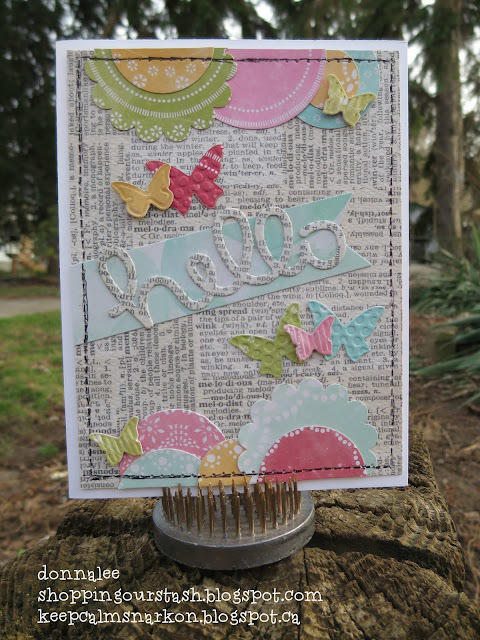 Awesome layout and sweet details, I have that SU Butterfly Embosslits, love the beautiful embossed look on them.